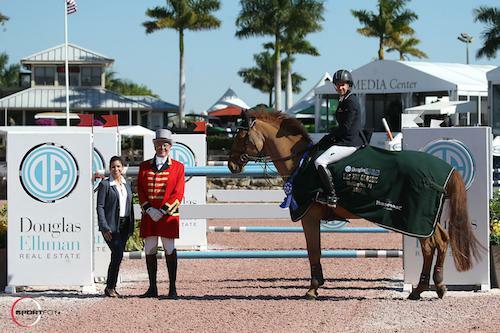 Wellington, FL – March 15, 2017 – U.S. Olympic team gold medalist Laura Kraut was victorious riding Caelle in the $35,000 Douglas Elliman 1.45m speed class to open week ten on Wednesday, March 15, at the 2017 Winter Equestrian Festival (WEF) in Wellington, FL. WEF 10, sponsored by Horseware Ireland, features CSI 3* competition at the Palm Beach International Equestrian Center (PBIEC) on March 15-19, 2017. The week’s highlights include the $130,000 Horseware Ireland Grand Prix CSI 3* and the $35,000 Hollow Creek Farm Under 25 Grand Prix Series Semi-Final, presented by The McNerney Family. All of the week’s live streaming can be viewed HERE. The 12-week WEF circuit continues through April 2, 2017, awarding over $9 million in prize money. Michel Vaillancourt (USA) set the speed track for 69 starters in the morning’s 1.45m and saw 20 clear rounds. Kraut rode Stars and Stripes’ Caelle, an eight-year-old Zangersheide mare (Clinton x Darco), to the winning time of 62.25 seconds. Laura Chapot (USA) placed second in 62.31 seconds riding her own and Mary Chapot’s Thornhill Kate. Emily Moffitt (GBR) crossed the timers in 63 seconds to place third riding Poden Farm’s Zagahorn. Lisa Goldman jumped into fourth place in 63.15 seconds aboard Barbara Disko’s Sovereign. Chapot also took fifth place honors, riding her own and McLain Ward’s Quointreau un Prince to a time of 63.26 seconds. “I am really pleased,” Kraut said of Caelle. “I got her at the end of her six-year-old year and just spent last year doing the seven-year-olds. This was her first time ever jumping FEI, so she is off to a good beginning. Caelle will jump again in Friday’s 1.45m competition. Kraut is taking her time bringing the mare along and hopes to step her up to 1.50m later this season. Laura Kraut in her winning presentation (Whitney standing in for Caelle) with Jasmine Velez of Douglas Elliman Real Estate and ringmaster Steve Rector. Also competing in the International Arena on Wednesday, Amber Harte (USA) and Austria 2 won the $6,000 Illustrated Properties 1.40m speed class. Georgina Bloomberg (USA) and Gotham Enterprizes’ South Street were victorious in the $6,000 Illustrated Properties 1.40m Power and Speed. 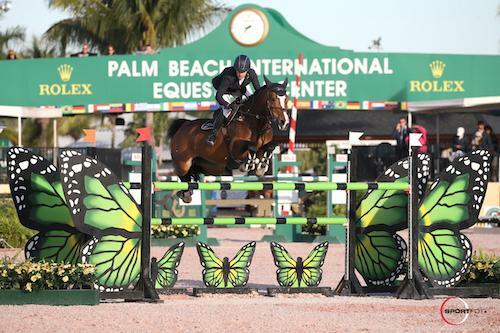 Week ten of the Winter Equestrian Festival continues in the International Arena on Thursday featuring the $35,000 Ruby et Violette WEF Challenge Cup Round 10 and $10,000 Hollow Creek Farm Under 25 Grand Prix Series Welcome. For full results, please visit www.PBIEC.com.